Concrete slab moisture is a major cause of concrete flooring failure. When concrete is mixed and poured, water vapor migrates from the bottom of the slab to the surface to evaporate. This process requires time and quantifiable concrete moisture measurements to verify. ASTM F2170 formally recognizes the use of in situ probes as a means of conducting relative humidity testing. In fact, ASTM F2170 represents a fundamental change in moisture measurement. 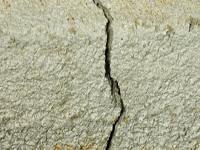 This is a high angle view of a crack forming in the concrete foundation footing inside of a residential house. In lay terms, the American Society for Testing and Materials recognizes that floor coverings often fail due to unsuitable concrete moisture levels beneath them. In that case, builders did not allow the slab sufficient time for concrete moisture levels to equilibrate (reach equilibrium moisture content) according to relative humidity (RH). Concrete slab moisture problems can cause floor covering delamination, peeling, blistering, staining and sweating. In-situ probes deepen concrete moisture measurement. For decades, builders used (and some still do) the anhydrous calcium chloride test for concrete moisture vapor emissions rate (MVER). The MVER is defined as the rate of water vapor emissions from the surface of concrete and is determined with the use of a desiccant material sealed to the slab surface for a specified time period, then measured. It has been believed that the change in the desiccant weight could be translated into a moisture ratio for the concrete beneath. In-situ concrete moisture testing places sensors, or probes, inside the slab itself. As concrete dries, moisture migrates from the bottom of the slab to the surface where it can evaporate away. Logically then, moisture levels at the bottom of a slab will read higher from those at the surface. In-situ probes provide relative humidity (RH) measurements at 40% of the slab’s depth*, a position proven to more accurately portray the final RH levels of the slab if it were to be sealed at that point in time and the slab moisture allowed to fully equilibrate. In this way, in situ measurement provides a composite picture of overall slab moisture levels, and provides the data necessary to make business decisions regarding flooring installations. Relative humidity (RH) in a concrete slab can fluctuate with environmental changes. Concrete absorbs water vapor from the air under high ambient humidity; concrete releases more water vapor when the humidity of the surrounding air is low. Surface-based test results will fluctuate, even more, under these changes in environmental conditions. General contractors must bear in mind two interactive processes when they are looking at construction schedules: concrete slab drying, and internal changes in relative humidity. Ground moisture can also impact relative humidity in a concrete slab. Foundations are poured over, and underneath, ground level (also known as “grade”). Sub-grade water vapor can permeate even well-mixed and applied slabs. Many contractors use vapor barriers directly under the slab to slow moisture permeation. And moisture can still be an issue at grade so concrete foundations must be designed to include proper moisture drainage. Without it, even a well-dried and functioning foundation can end up with concrete slab moisture problems. In situ moisture measurement systems are evolving rapidly as a result of ATSM F2170 and reflect the industry realities of the concrete installation business. 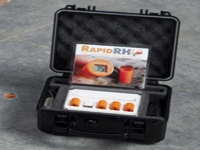 For example, Wagner Meters Rapid RH® system includes probes which remain in the slab for faster readings because re-equilibration time is not needed. Flooring associations like the Maple Flooring Manufacturer’s Association are recommending RH testing as giving greater success with flooring installations. And installers are finding results are more accurate and more dependable with RH testing. It’s a sure sign of advances in the industry of concrete moisture management. *This depth is for slab’s drying from one surface only. For slabs drying from two sides, ASTM F2170 specifies RH probes be placed at 20% of the slab’s total depth.